This article was first published in Hype & Stuff on 13 February 2018. With all its overtly bright visuals and unorthodox buildings, the streets of Osaka are nothing short of entertaining. Tourists flock there to find and feast upon the multitude of delectable street eats or stare wide-eyed at one or two scantily-clad anime cosplayers. There is always something interesting to look forward to at every corner and this is where the soul of the city lies. 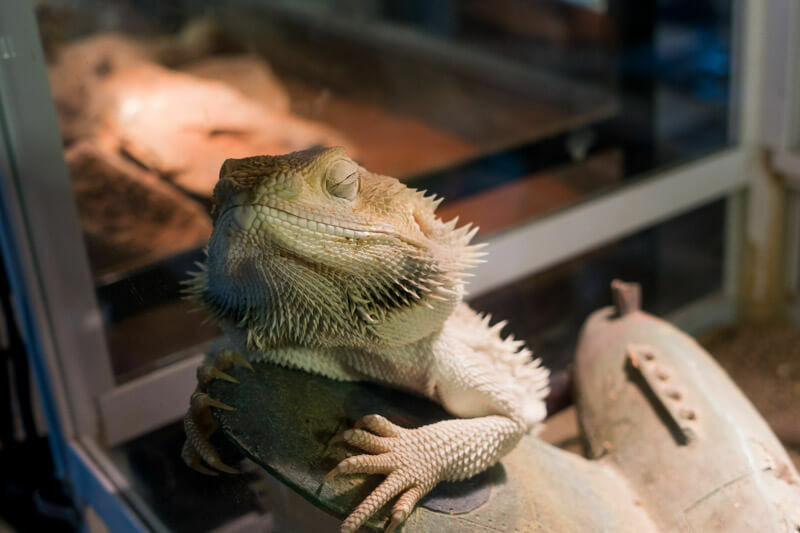 Rockstar Reptile Cafe is one such find. If not for the small signboard located at the front of a seemingly insignificant building, this oddball, which sits on the third floor, can be rather difficult to locate. 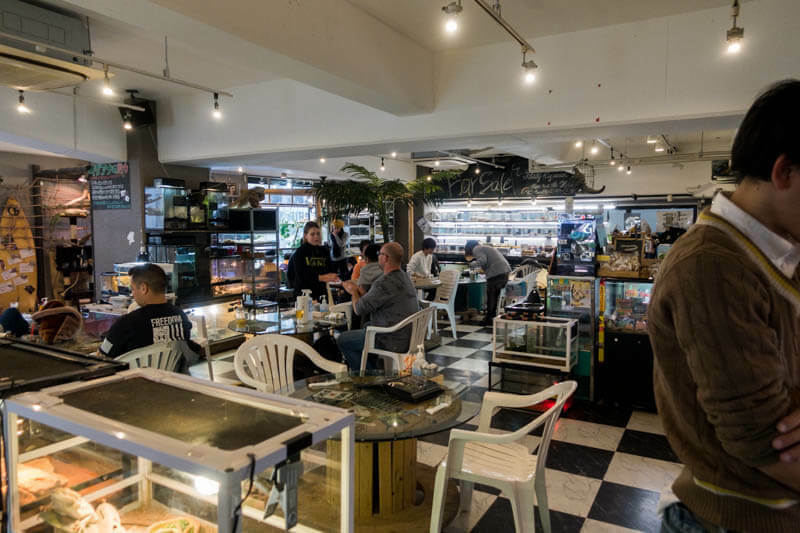 Unlike most animal cafes which feature endearing animals, Rockstar is not for the faint-hearted and has a spot on the opposite of the cute spectrum. If reptiles, arachnids, and bugs aren’t your thing, you should probably stop reading this and head here instead. There were already quite a few customers in Rockstar when I entered the spacious and brightly-lit cafe. 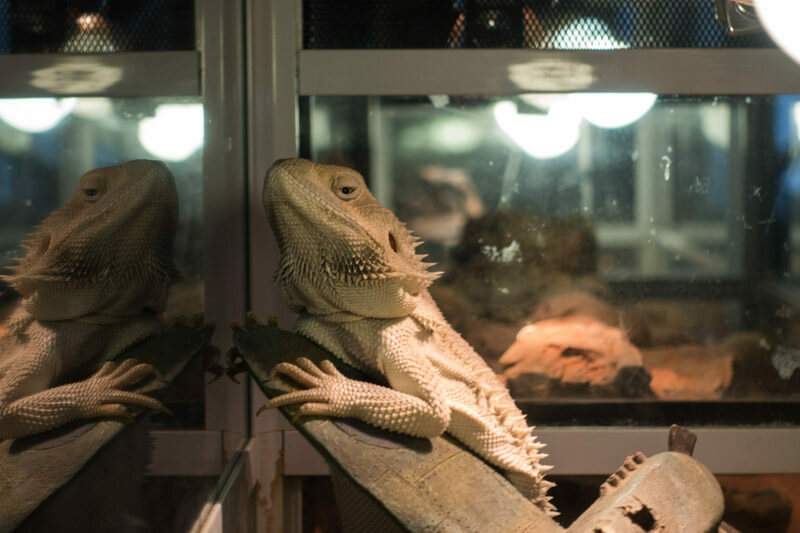 I picked up on the heat before noticing the shelves containing the tanks of reptiles around the store. 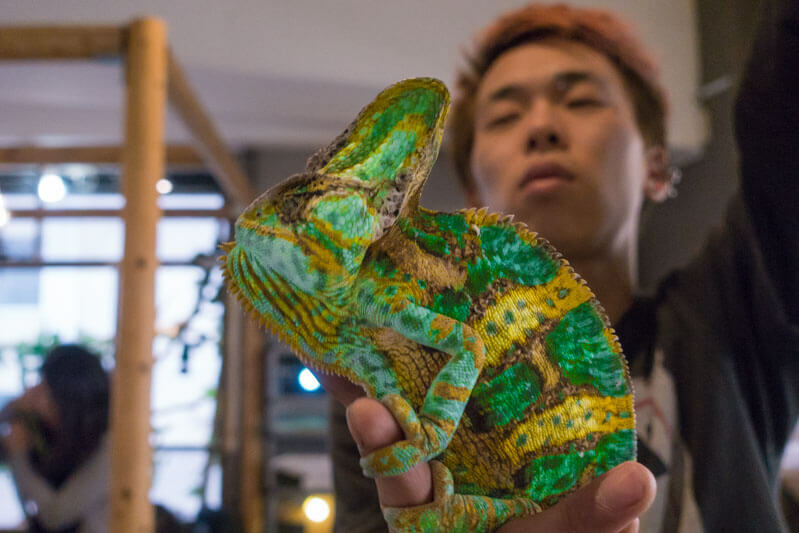 The staff who spoke little English told me that it was to regulate the temperature and set the right environment for the creatures that live there. Rockstar opens from noon to 10pm and has a one-time entry fee that comes with a lifelong membership at ¥1,000 (approx. S$12) per person. There is a minimum order of one beverage per person, and you are also required to read the guidelines before ordering. 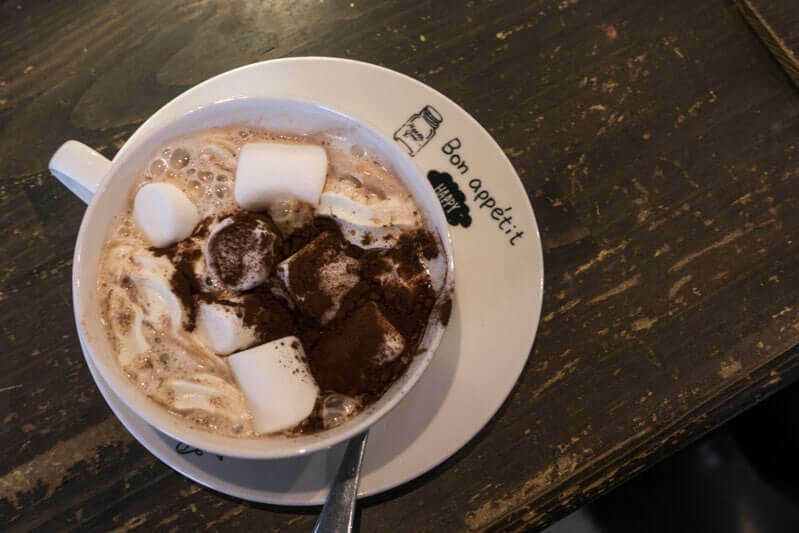 Like any other cafe, you’ll also find a food menu that caters to the famished. 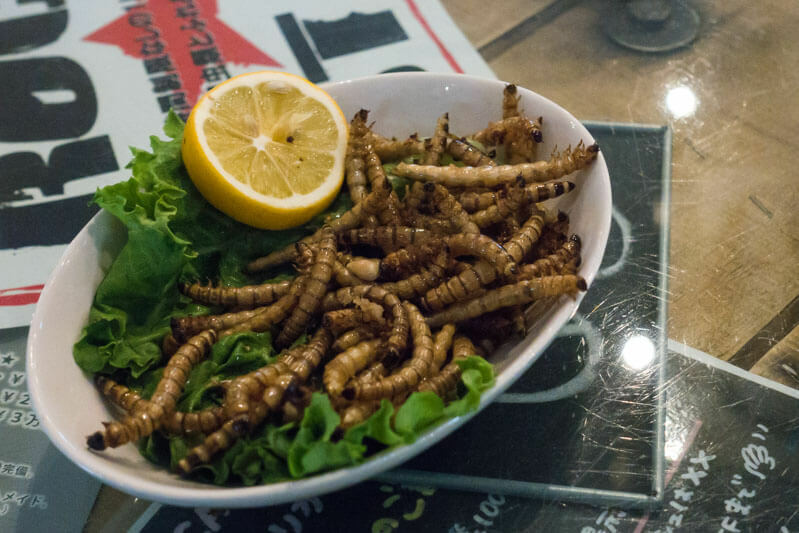 Thrill-seekers can even ask for the special menu and feast on some “interesting” snacks or alcohol — think fried worms and centipede alcohol. 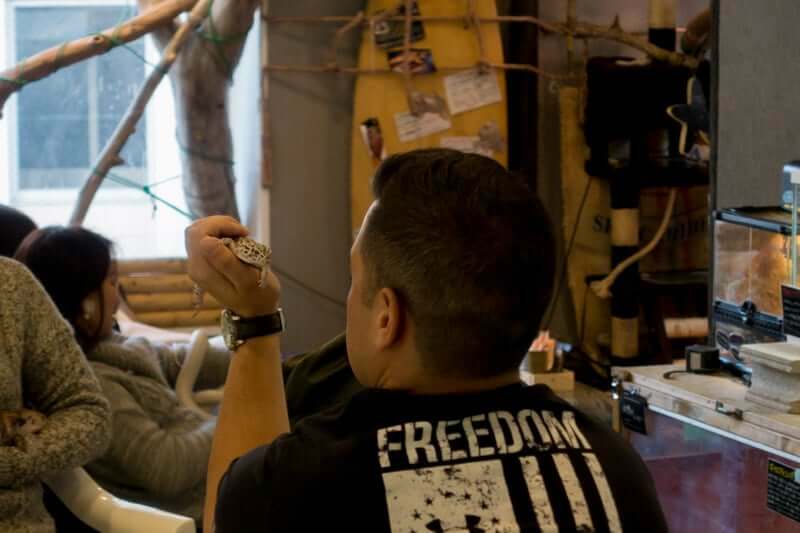 Jostling between the register and tables, store manager, Umada Kyosuke, and his staff were proactive and warm. They were systematic in the way they worked: a member of staff would greet and usher in new customers at the register while another would take over with the menu, all ready to give a quick brief on the cafe’s guidelines. 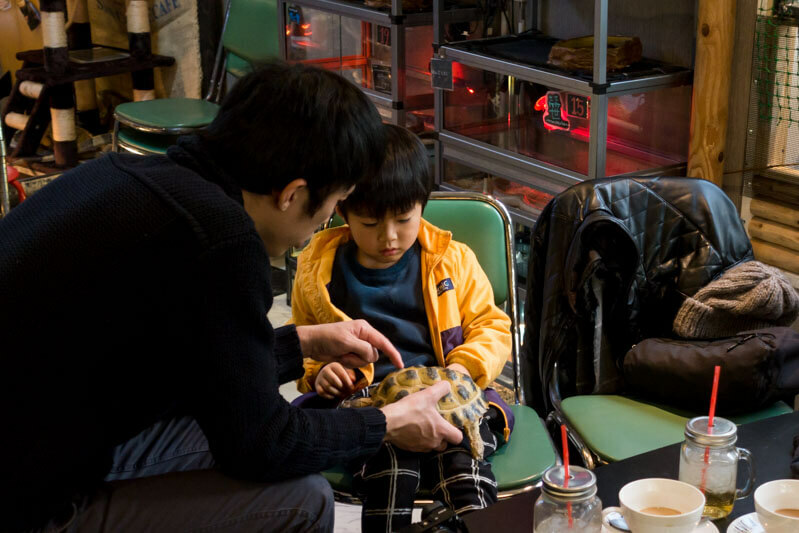 Kyosuke’s approach is simple: he wants customers to feel comfortable before interacting with the in-house pets. In a way, it is to the benefit of the creatures. After all, the less flustered you are, the better you’ll handle the docile animals. Camera-ready, I embarked on a quick tour around the cafe. 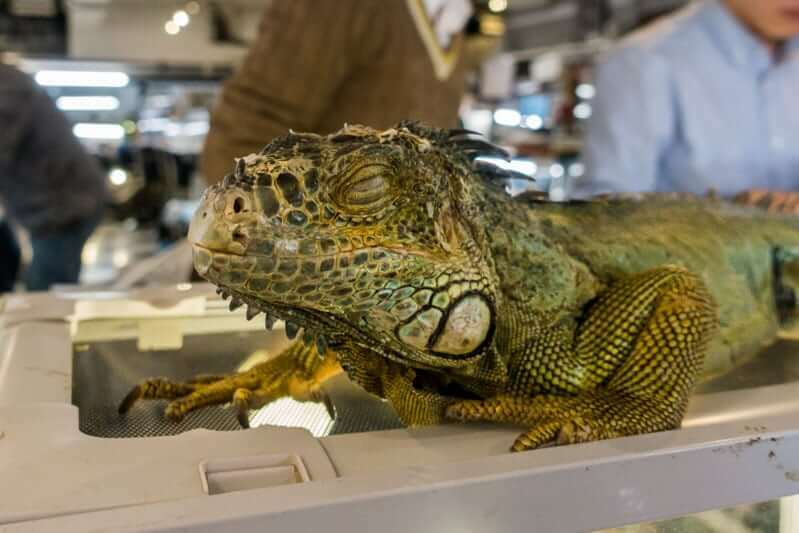 You will probably spot one or two iguanas “basking” on top of their warm tanks in Rockstar, where, interestingly enough, it’s also home to small critters like spiders and centipedes. There are more than one species for each type of reptile in Rockstar. Yes, that means different breeds of snakes, tortoises, lizards, and bugs. 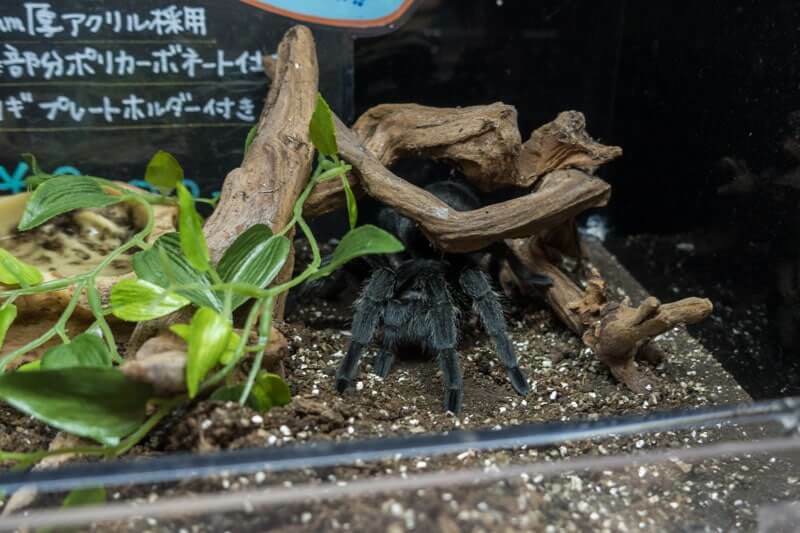 Most of them are kept safely in glass tanks, so you need not worry too much. 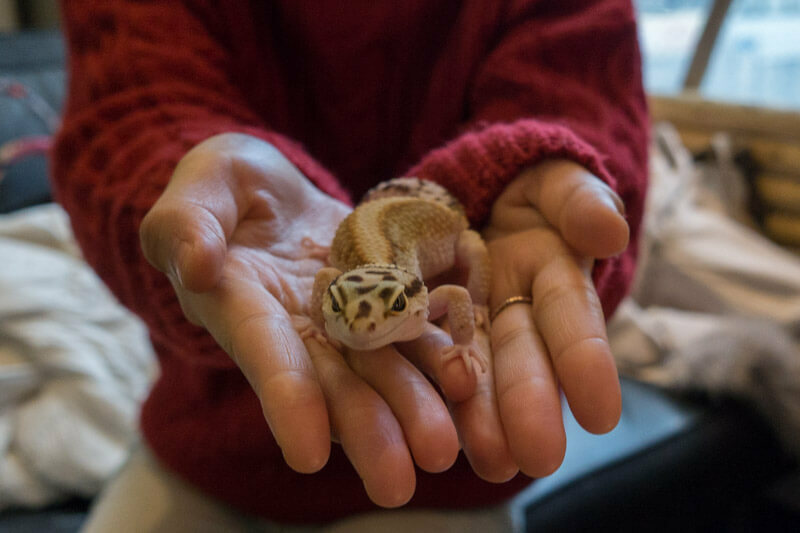 You would have to seek the staff’s assistance if you want to hold onto or cuddle the creatures. 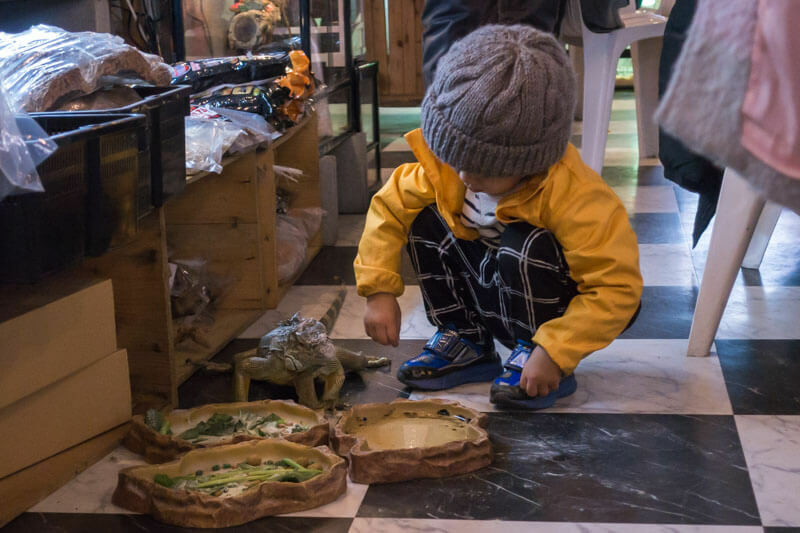 But not all the animals can be held; newborn reptiles, small-sized reptiles, and chameleons are exceptions in the cafe. 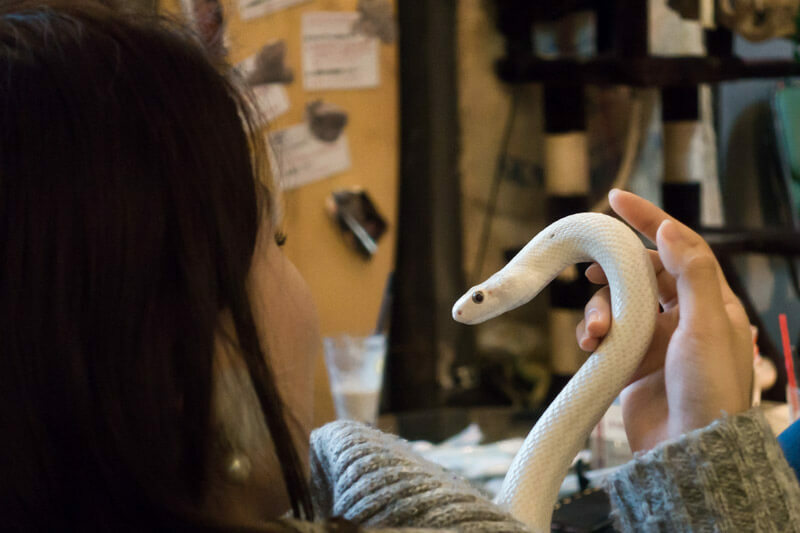 With Kyosuke’s help and supervision, I had the opportunity to make friends with one of the cafe’s snakes. 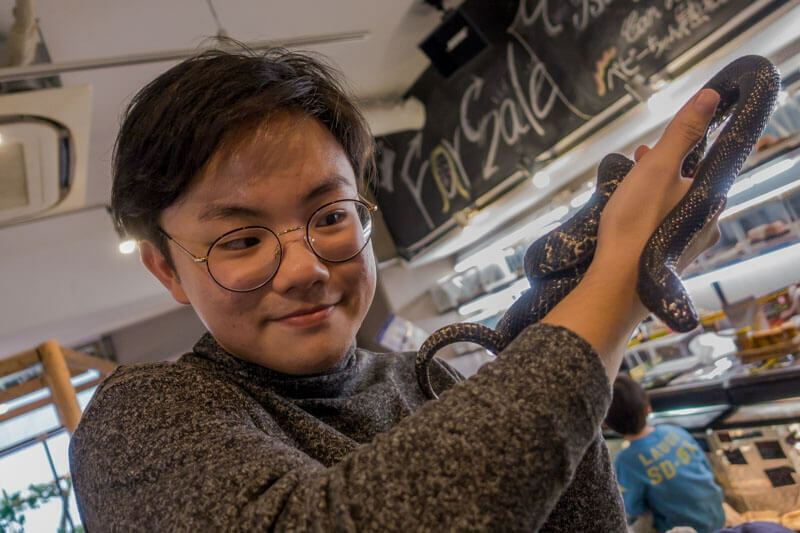 While the cafe’s snakes are not venomous, I held it tenderly at a slight distance away from me, fearing that it would lunge and bite. It didn’t, and just tickled me a little as it tried to slither away. 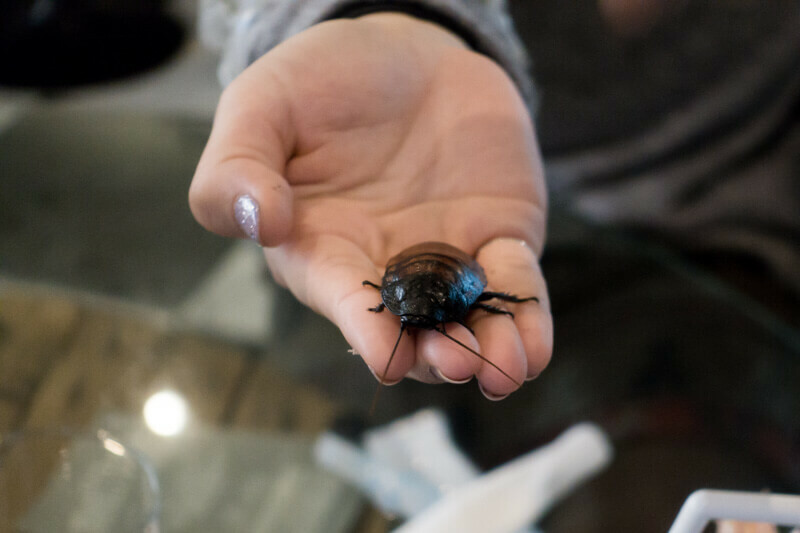 If you are feeling exceptionally daring, you may even request for a roach to be placed on your palm too. I did try to muster the courage, but I failed and almost ended up flinging that “thing” back at Kyosuke, who choked back a laugh. It was clear that I didn’t have my balls guts with me then. I was glad to hear that I could cuddle with the docile creatures or stay on for as long as I wanted in Rockstar. My stay there was wholly interesting albeit daunting and slightly creepy at first. 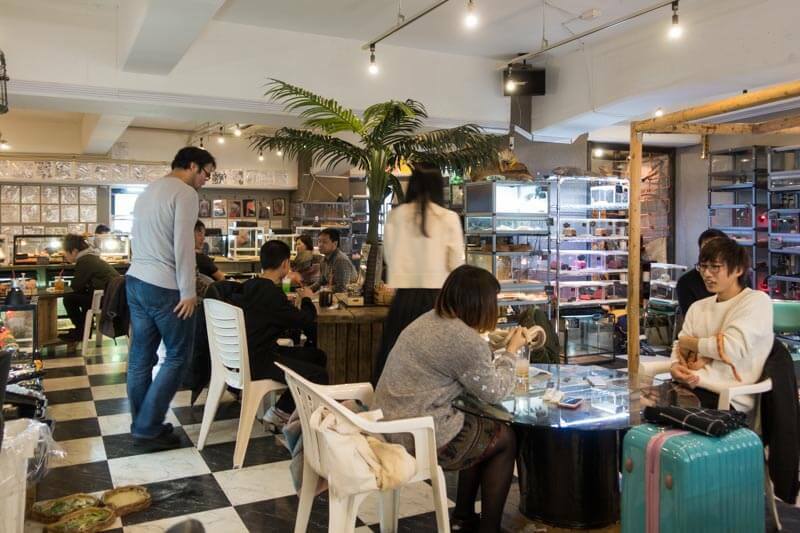 If you’re done with the more conventional touristy activities in Osaka, check out this unique cafe for a completely different experience!